Toddler Girls Size 6 Converse Shoes Gray Pink Double Tongue. Condition is Pre-owned. Shipped with USPS Priority Mail. Converse All Star Gray Low Rise Size 7 Toddler. Condition is Pre-owned. Shipped with USPS Priority Mail. CONVERSE ALL STAR CHUCKS Infant Toddler Shoes. I will work with you to obtain a resolution. Non smoking/ no Pets. Great, gently used condition with minimal signs of wear. Toddler size 7; gray outside, double tongue -- the upper one is gray and the lower one is teal with a hot pink Converse label. You are looking at a pair of Converse All Star Chuck Taylor toddler girls low top shoes in size 5. These are in good used condition with lots of life left! LOTS OF TODDLER SHOES AND CLOTHING! Condition is Pre-owned. Excellent like new! Converse All Star low top double tongue shoes in toddler size 6. Gray shoes with red trim and lining. White rubber trim and laces. EUC. Converse All Star Hi Top Toddler Size 9 Boys Grey. Condition is Pre-owned, but look brand new. Only wore once. Shipped with USPS First Class Package (2 to 3 business days). Converse All Star Toddler Girl Shoes. Bow accent on back. In GREAT condition. NO scratches, scuffs or creases! Insoles look great! Look at the detail on the shoe! These are White canvas with gray suede. The bottom of the shoe has a pink stripe around it w/Pink laces. In great condition. No scratches, scuffs or creases. There is one spot on the back yellow stripe on the left foot. Worn by a non-walker. Actual colors may vary. This is due to the fact that every computer monitor has a different capability to display colors and that everyone sees these colors differently. ALL THE PHOTOS. Infant Converse Grey 3C. Condition is Pre-owned in a great condition. US and PayPal bidders only. In GREAT condition. Limited Edition. Converse Toddler Girls Pink & Grey EUC Sz 5. Condition is Pre-owned. Excellent Used Condition. Some very very minor scuffing on the toes. Shipped with USPS First Class Package. Toddler boy dark gray converse All Star shoes size 10. Bought them used and my son never really wore them. They are in great condition. Smoke free home. Shoes are in great condition. Have elastic to allow extra room to slip shoes on. Gently used grey converse shoes. Still have plenty of life to them. Sh oe s iz e is 6 Y. Pl ea se s ee a ll pictures be fo re purchasing. CONVERSE ALL STAR TODDLER BOYS TENNIS SHOES. GREAT SHAPE. NO HOLES OR STAINS. LIKE NEW!!! These All Stars are Gray and Black with Bright Green accents. They are great for first time walkers, as they are easy to slip on and off, but also have a lot of support as they are mid-tops. They are in EXCELLENT CONDITION and don’t show visible signs of wear except for the bottoms. I take great ownership in my belongings and like to keep them looking their best, if they don’t, I won’t sell them! These converse are so cute and go with everything! Perfect for your new little walker! Thank you for looking and make sure to check out my other listings! Excellent condition! Just a few minor scuffs. In EXCELLENT condition. Never worn outside! Toddler Girls Converse All Star Pink White Gray Size 7 - New! 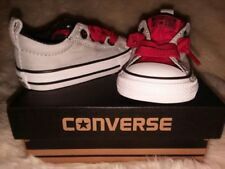 Brand new Converse All Star toddler girls size 7. Tag says it is part of "The Converse Slip On Collection" - shoes have laces but don't tie. Pretty pink color with lighter pink and gray (alternating colors) laces with white toe and sole. Shoes were never worn. My daughter grew into the next size before she had a chance to wear them. Very minor scuff/dirt marks that could probably be easily cleaned off (was like this when I bought them brand new from the store - see last picture for close up) doesn't impact overall look. Because the shoes weigh almost 10 oz, shipping is $5.66 but I will split shipping so you only pay $2.83. Please feel free to check out my other listings as I will be updating it with more clothes/shoes from our closets! •Signature CTAS logo at heel & tongue. •Colors are Navy & Glacier Grey in a colorblock detail. •Sure-Grip rubber outside in the traditional CONVERSE traction pattern. •Canvas (textile) upper. •Canvas (textile) lining. 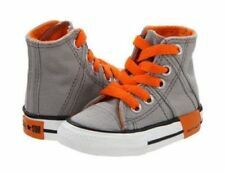 Toddler boys Converse One Star Chuck Taylor hi top sneakers in Gray. MODEL:All Star 750600C. STYLE: ZIP HI SNEAKERS. GENDER: INFANT GIRL. COLOR: WHITE/ SILVER/ PINK. If there are any flaws they will be disclosed. SIZE: US 7 / UK 7 / EUR 23 / CM 14. Unisex Baby Converse All Star Shoes. Size 4 Toddler. Grey In Color With White Laces/Detail.